Sunbird is excited to be attending the Uptime Institute Executive Symposium: Las Vegas on September 18, 2017 at the Bellagio. Stop by Booth 3 to meet our data center experts and get a demo of the new features and enhancements in our award-winning Data Center Infrastructure Management (DCIM) solution. The Uptime Institute Executive Symposium is "an executive-level, highly focused, one-day program for Infrastructure Leadership and Operations stakeholders who have been tasked with improving the performance, efficiancy, and reliability of their business-critical infrastructure." Learn more and register here. 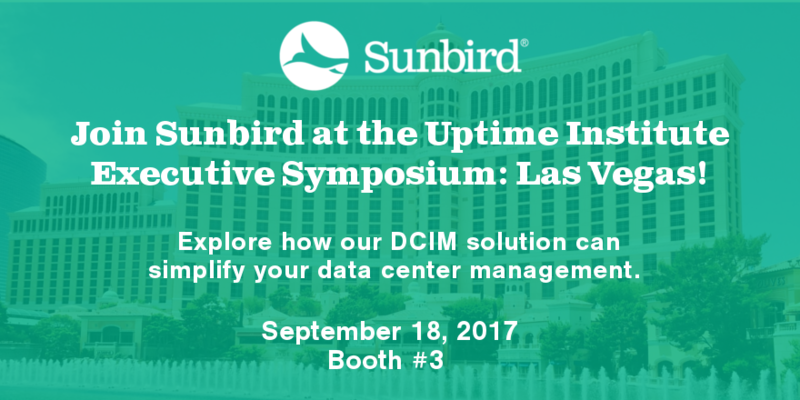 Heading to the Uptime Institute Executive Symposium in Las Vegas and want to chat one-on-one with a DCIM expert? Our local Sunbird representatives will be available for individual meetings. Let us know if you'd like to meet.